Home for the weekend? Tuck the kids in their pajamas while you cook Creamy Crab and Corn soup from scratch. No need to go out when you can bond over flavorful soup indoors. 1. 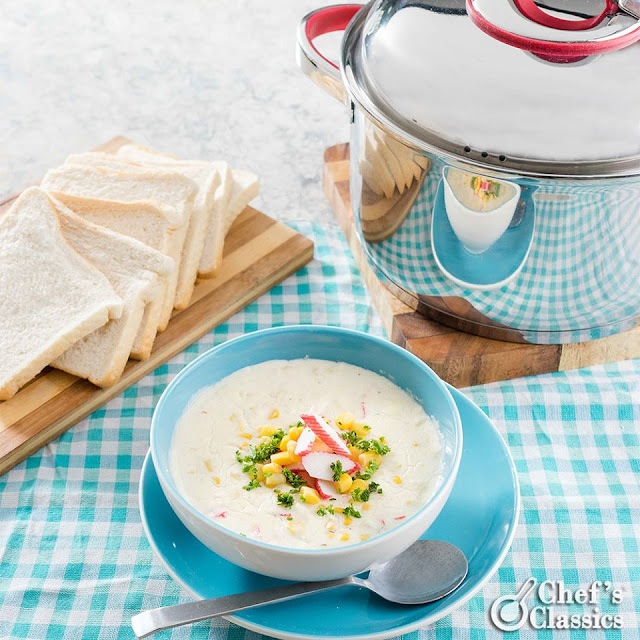 In a Chef's Classics Ashley Stock Pot, bring chicken stock to a boil. Add the cream-style corn, cooking wine and soy sauce. Mix well and simmer for 5 minutes. 2. Add dissolved cornstarch and continue to simmer for 3 minutes until the soup is thick. 3. Add the eggs one at a time and mix well. Add the kani and season with salt and pepper. Continue to cook for a minute until the eggs have set. 4. Garnish with chopped kani and green onions.